Josh Brock began racing in 2005 in the Mini-Stock division at Corbin Speedway and Mount Vernon Speedway. In his inaugural season he brought home 15 wins, 11 poles and a championship. From then, his love of racing stuck. Brock joined the Pure Street division at Corbin Speedway in 2006 and earned five wins, nine poles and finished fifth in points. In 2007 Brock continues his success accounting for seven wins and five poles in his Pure Street car and went undefeated in his dads Super Truck with two wins and two poles. At the end of the year Brock traveled to Florence, SC and won the big Senaca 600. He set a track record and led every lap. In 2008 Josh raced Corbin Speedway and Tazewell Speedway and won the first night out that year on dirt. He ended the year with nine wins and four poles. Brock also got the chance to race at Bristol Motor Speedway with his Camaro and finished 3rd. This was also the year he began dabbling in the Super Late Model world, getting behind the wheel for a few practice sessions. After finding success in the Pure Street division, Brock made the big jump to Late Model racing in 2009. He competed at Corbin Speedway with six wins and five poles and also in the Ken-Ten Pro Late Model Series. The Kentucky driver finished 2nd in points in the Ken-Ten Series in his rookie year with one win, nine top-five finishes and 10 top-ten finished. From there, Brock won the K&N driver sponsorship and got the opportunity to drive for Ron Sutton of Victory Circle in California in 2010. He competed in the NASCAR Whelen Modified Series at All American Speedway and in 16 starts earned one win, 11 top-five finishes and 15 top-ten finishes. Along with Late Models, he won the Hooters 250 at Highland Rim Speedway, he also competed and won in the Pure Street classes as well. In 2011, Brock returned to Kentucky and raced Super Late Models and Pure Street on asphalt and Open Wheel Mods on dirt. He also won the Corbin Speedway track championship and went undefeated this year at his home track. From 2012 to 2016 Brock’s stream restoration company was picking up, so he raced on and off. When he did race, you could find him at the big local races and more often than not, in Victory Lane. In 2017 Brock had hopes of jumping back into racing full-time. 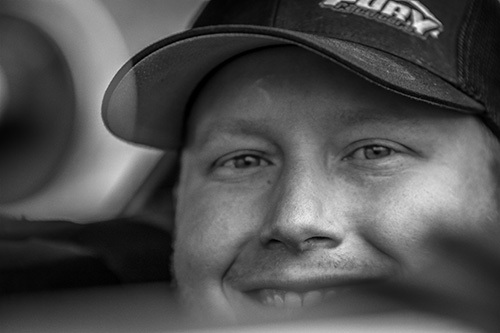 He committed to run the full ARCA CRA Series and was off to a good start, sitting 1st in points, before being diagnosed with Non-Hodgkin’s Lymphoma in July. The doctors told him it would be best to take some time away from racing while battling the disease. After months of treatment, Brock was pronounced cancer free on January 1st, 2018. With that diagnosis also came his chance to get back into a racecar. Brock rebounded from his cancer diagnosis with a career best year. He won the 2018 ARCA/CRA Super Series championship and also picked up his first series Super Late Model win. The Kentucky driver held the ARCA/CRA Super Series point lead almost all season and capped it off with a solid run at the Winchester 400 to finish the highest of the four chase competitors and claim the championship title.